One of the mediaeval small-holder’s most important crops was his pea crop – they were not eaten as young sweet garden peas, but were left in the pods to mature and dry. 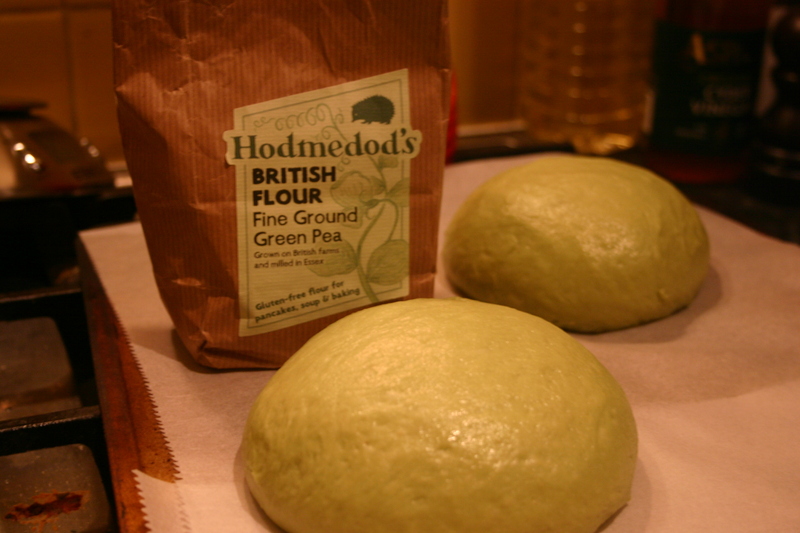 The peas became starchy and packed with protein; an excellent nutritional source for the winter months. We use those dried peas today for mushy peas or split peas. Then, they were mainly used in pease porridge/pottage. The pease were often ground to make peasemeal to thicken stews, and to make bread for cattle. People only ate it themselves in times of winter famine, and this peasebread was hated by all. Peasebread and peasemeal stopped being produced in most of the UK, but it did live on until the mid-20th Century in the very North of Scotland and Orkneys, where very few crops can be grown in abundance (rye and oats are the only others really). Folk enjoyed pease scones, bannocks (flatbreads) and breads, but it was still associated with poverty. Peasemeal is considered easy to digest, partially due to its lack of gluten, and is high in protein and carbohydrates. I quite like how some of these mediaeval ingredients are being re-examined during a time of vegan and paleo-dieting. It is strange to think how the poor were eating healthy vegetables with little fat, red meat, salt and sugar, considered then to have no nutritional value. Meanwhile, the bunged-up rich were chowing down almost entirely on meat, spice, white bread and sugar, in the belief they were eating properly. I bet their bedchambers sank in the morning. I had to have a go at the derided peasebread, just to see how bad it was. 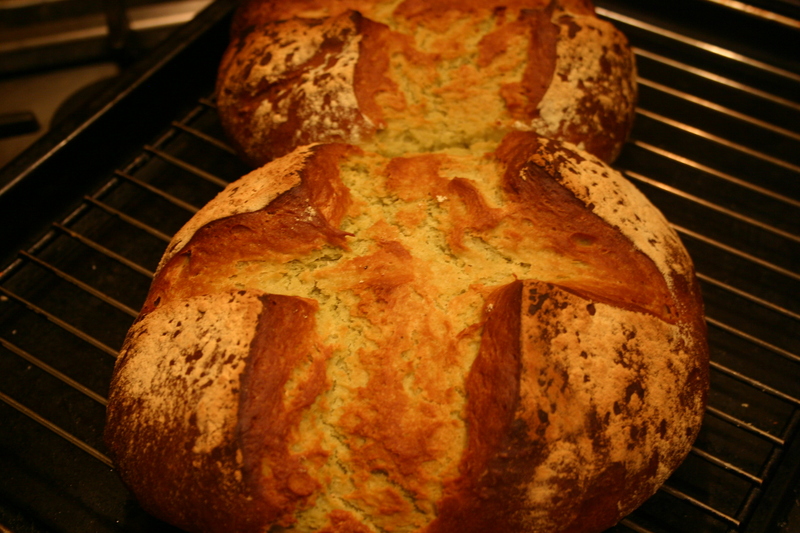 I did cheat a little bit and mixed the peasemeal with some strong bread flour. It was pretty straight-forward to make, though the dough was very sticky was hard to knead. The resulting bread was dense and a little crumbly, but had a delicious sweet pea flavour, with hints of roasted peanut butter. Probably too dry to eat on its own, it was great toasted, buttered and dunked in soup. So, here’s my recipe for peasebread. It made two flattened cobs. In a wide mixing bowl mix together the two flours. To one side of the bowl place the salt, and place the yeast to the opposite side. Make a well in the centre and pour in the oil/fat and the water. Mix with your hands to form a dough. Leave to settle for ten minutes. Spread a little oil on a work surface and knead until smooth. This is pretty tricky because it is so sticky, so use a dough scraper to help. Oil a bowl and place in the dough inside and cover. Leave to rise until it has doubled in size, about 2 hours. 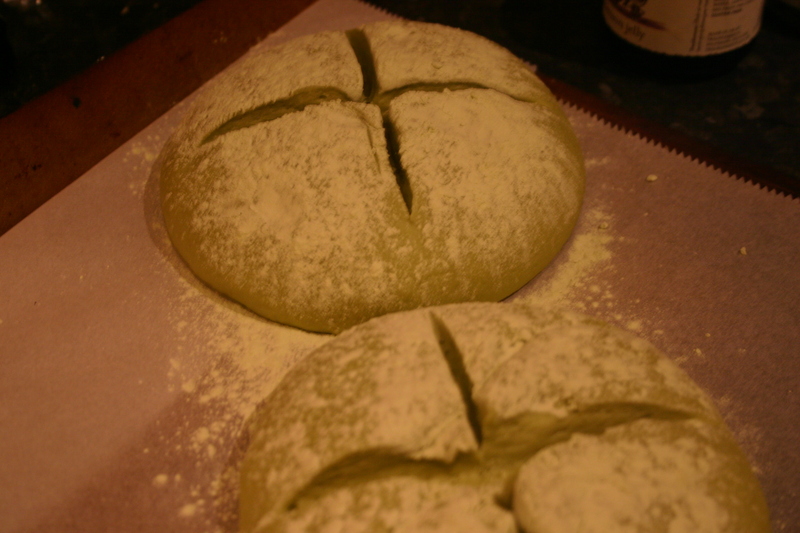 Knock back the dough, divide into two pieces and form in to two taught, round cobs. To do this, roll into balls with oiled/floured hands, then tuck in the dough underneath whilst turning the ball, tautening the surface. Place on greased baking trays, flour generously and cut a cross in the centre. Cover with large plastic bags and leave to rise again for about an hour. Place the cobs in a cold oven, then set the temperature to 230⁰C and bake for 40 minutes. Cool on a rack. Long ago in the late 60s/early 70s I lived in Glasgow, and being extremely short of the wherewithal to feed our family I discovered wonderful institutions known as grain stores, now I believe extinct. They sold pretty much anything that could be turned into grain both whole and ground, along with other powdered foods such powdered milk, powdered egg, potato powder etc. Not to mention a wide variety of dried vegetables.Everything was in sacks with scoops and there were piles of paper bags so you could just buy the amount you wanted. Nowadays one would need to go to a branch of WholeFoods in the US to get a fraction of the range. But they were a survival, not the latest manifestation of trendy sustainability. And yes, peasemeal was there and I often bought it to thicken soups etc., often finding myself the only customer under 80. Here in Dublin in the early 21st century powdered pea protein is found only in the most trendy and expensive of health food shops. Alas we have no Unicorn, somewhere I try and stop to shop on my rare passages through your part of the UK. I met the founders back when the whole organisation was a twinkle in their eye and it is wonderful that it has surpassed the dreams they had at the time. What a great article! Really interesting. I’ve been stocking up on alternative flours lately: chickpea, rice, buckwheat, rye, spelt & coconut – other than a few attempts at making healthy cakes and breads, I’m not very adept at using them yet! They are tricky things – better used for pancakes most of the time (then covered in butter and syrup!). 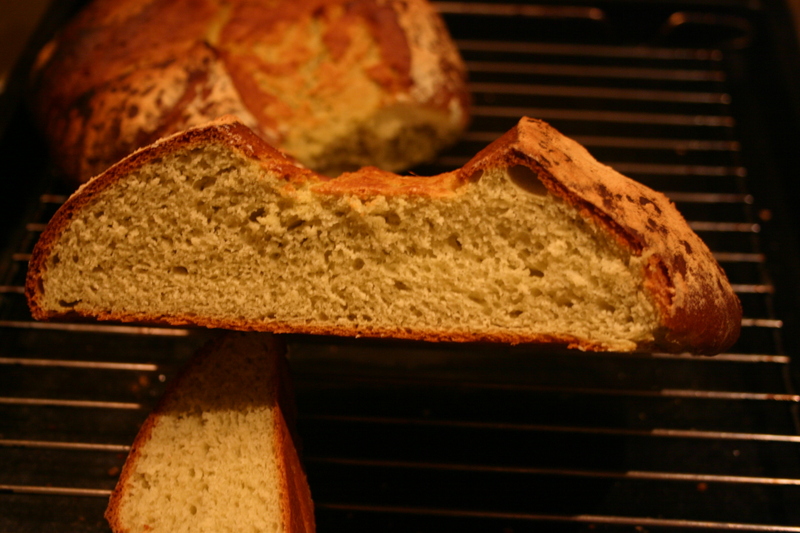 When I make these breads, I always use a proportion of regular bread flour, otherwise they are too difficult to handle! Yes I have a lot to learn about flours! We’re working on our own gluten-free flour mixes at The Buttery at the moment; trying to come up with something more user-friendly…we’re getting there! The million dollar question: How did it taste?!?! It looks delicious! 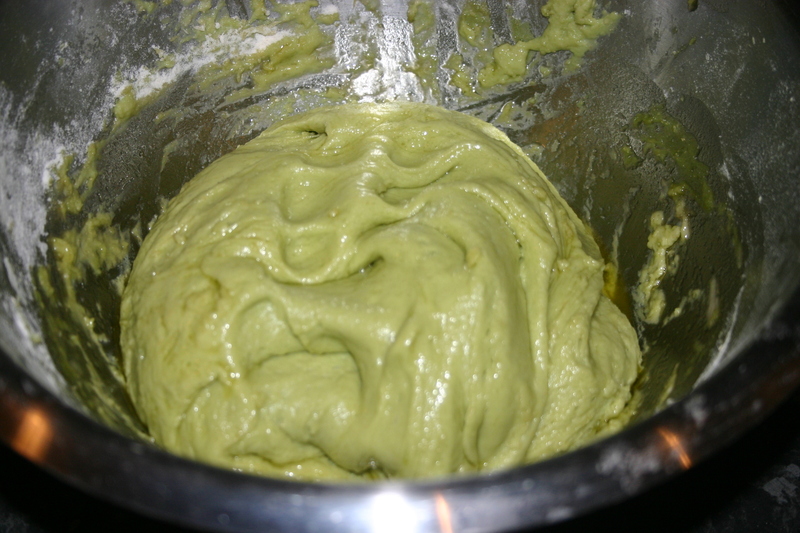 The green dough is a bit off-putting, but the final product is lovely. Like peas and roasted peanut butter. Pretty good! Brilliant blog – do you have an email address that I can contact you on? Sure, what is it regarding? A client of mine is hosting a factory tour and they’d love you to come along. They are a British brand and manufacturer of an essentially British product, with plenty of heritage and craftsmanship – please let me know if you’d be interested! Intriguing! I’m trying work out how to give you my email without publicly posting it! It is old English / European recipe, try to think as they would and explain as they might do sharing a recipe. May I ask where the bluddy heck would those fellers ever have got a plastic ferkin bag.. I ask you, would a thin sliver of bladder kelp or similar do the same job??? This is from an old hunter gatherer from the antipodes. When I don’t have a plastic bag I go for a moist tea towel which is almost as good. Anything that will stop the dough from drying and forming a skin, thus preventing it from rising, will do! Golspie Mill in Sutherland produces Peasemeal and there are numerous stockists throughout Scotland. Checkout their website.